If you are expecting something fancy, read no further. 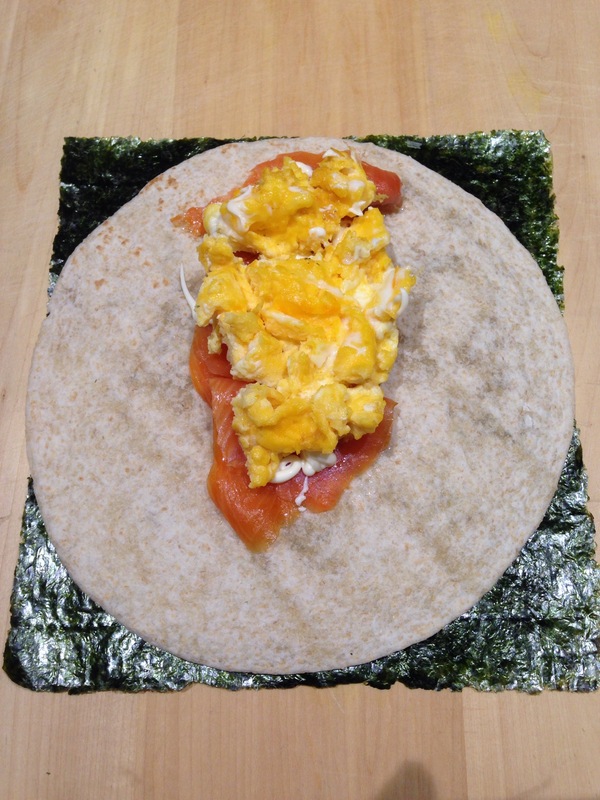 This is simply a tortilla wrap filled with smoked salmon, cheesy omelette and wrapped in some spare nori I found in the pantry. There’s really no name for this wrap – I just wanted to have a bit of fun sounding like a typically pretentious, unimaginative, generic ‘foodie’. And if you were like me, you would have picked up on it by simply reading the title. By the way – this isn’t to say that everyone who loves food is like that – and I don’t mean to sound nasty either. Hopefully I can explain myself better below. I have a draft post detailing my feeling about naming foods. I won’t bother repeating much of it here. The general gist though is that I absolutely hate it when people call their foods fancy names with the food usually coming out quite ordinary. I hate it even more when people use verbs in their names. I hate names like ‘Open Sandwich’ or a ‘Deconstructed Taco’. Just saying those words in my mind makes me maddddddd. It should really be something like.. “Lazy Chef’s Sandwich… or Lazy Chef’s Taco – in my mind anyway. Have people really become so uncreative and unimaginative that they have to add a verb to a well known dish – separate all the components – and take pride in believing they have created something groundbreakingly different? Whenever I read those words in relation to food I immediately ignore them on the menu – it also tempts me to not return either because it just seems pretentious & tacky. It’s like me having a recipe for a separated sushi… or a flattened pancake. Anyway, more about that when I finalise my ‘rant’ post. Right now, here’s to this lovely wrap I made the other day. I make wraps like this quite often for work. It’s easy to make and very easy to eat. This wrap really benefits from the moist, smoked salmon. As I mentioned above, I had some nori sheets leftover. I decided to place the flat wrap on the nori sheet and wrap it up as per usual (the bottom up, right over filling, left over top old chestnut). Taste wise, it was great. When eaten immediately, the crisp nori really adds that fragrance and flavour we are so accustomed to with Japanese food. It make the wrap taste ‘Japanese’ – if that makes sense. If eaten overnight, the nori goes soft but still edible – it’s just a different experience altogether. I start off placing about 4 slices of smoked Salmon up to 2/3 the way down the wrap. I like to add a bit of moisture on top of the Salmon – something thick so that it doesn’t make the wrap too wet. This time I Jackson Pollocked some Kewpie Mayonnaise over the Salmon to go with the Japanese theme. Fast forward and I have put my cheesy eggs on the very top and the nori sheet below. After that, I simply wrapped it up as per usual without trimming any excess nori – no wastage! Have a go and tell me what you think!